WHY? Mandal's Homo sedens. - Sitting Safely? He observed that young children naturally sit with the chair tilted forwards onto the front legs. They then support their elbows on the table, which for a small child is the right height, and the protective lumbar lordosis is effortlessly and correctly maintained. As the child grows the height of the table becomes relatively lowered and the child then sits in the usual semi slumped position. This results in short episodes of backache, which are ignored, and possibly to permanent stretching of the posterior spinal elements which can predispose to instability and a lifetime of adult spinal pathology. 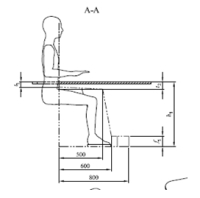 Drawing on the work of Keegan120 in the USA, Schorbath121 in Germany and Akerblom122 in Sweden he concluded that children are instinctively right to modify their seats to tilt forward with a slope of 10 to 20°. This allows the hip angle to open from 90° to 120° and the pelvis to rotate forwards, on it’s fulcrum at the ischial tuberosities, so that the lowest two lumbar joints are in the extended (safe, lordotic) position, ensuring the correct lordotic posture. No back rest was necessary and the torso was free to move. His proposed solution was a combination of height adjustable desking and forward tilted seat similar to the equestrian seat. 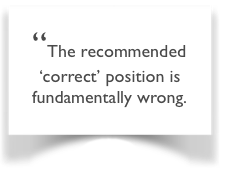 The recommended ‘correct’ position was fundamentally wrong. 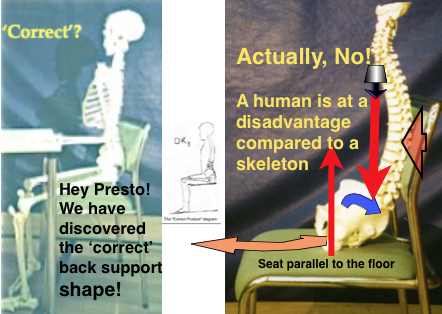 He suggests that this posture was developed by taking a standing skeleton and sitting it on a chair. A skeleton has advantages over a live human. It can sit motionless all day. It has no constraining muscles ligaments or IV Discs. It is steaded with an iron bar down the vertebral canal. There is a x2.5 increase in spinal loading over full reclination on the discs and 40% over that of standing upright (Nachemson, Sato but not Wilke). The pelvis tends to tilt backwards reducing the important and protective wedge (lordotic) angle at the lower 2 lumbar joints. 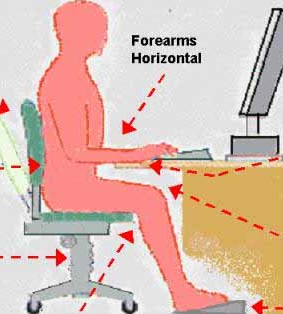 The position may be prolonged in an office or work environment. 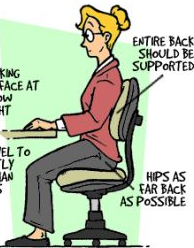 Lumbar (not pelvic) support accentuates this effect. And the hip flexion also tilts the pelvis backwards. the vulnerable lower lumbar joints are forced into a flexed position so that the protective high wedge angle is reduced to a point that the disc contents are liable to move backwards and protrude. He wondered how such a poor position could have been accepted as correct. A chapter in his book is titled ‘Functionalism’s instruments of torture’ and he dates the decline to the 1930 Exhibition in Stockholm which had the slogan “Beauty in everyday furniture”. Later he met the authority who created this concept who admitted that the image of the back of a standing person was simply cut and pasted to a drawing of a sitting person (personal communication). It has no scientific basis. This basic false premise is still regarded as ‘correct’, regardless of more recent scientific knowledge of spinal pathology and bio-mechanics and is still universally advised with an air of authority. Mandal claimed that 90% of lower back pain was related to loss of this lumbar lordosis. 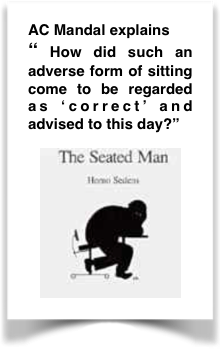 With the increasing liability to backache, an ergonomically ‘correct’ chair was sought. The lady is sitting bolt upright, to attention, like a guardsman. The body position shown is cramped and movement, which is necessary for comfort and disc nutrition, is hardly possible. There is no armrest. Some authorities maintain that this allows greater movement of the upper torso. However support under the elbows prevents dropping of the shoulder girdle which can be tiring and uncomfortable. Support at the wrists helps to prevent RSI. A greater viewing distance allows the intrinsic eye muscles to relax. The rule should be to be as far from the screen as vision allows comfortably. If necessary get glasses, tinted against glare, adjusted to 36 inches. This diagram might be acceptable, a semi-partial remediation, if the point was made that it incorporated the alternative ‘Pelvic (iliac) support’ instead of ‘lumbar support’ as is shown. This alternative solution of applying the support directly to the pelvic (iliac) crest, ensures that it was unable to rotate backwards. This support should be a particular shape and size to spread the pressure loading. (See later under ☛ Pelvic & Lumbar support→). There are now many well engineered and comfortable office chairs in the market. Most have a fundamental bio-mechanical fault. They rely on the mid- upright mode of sitting for prolonged work. As has been shown this combines the two most adverse effects although the backward pelvic tilt can be modified by a FTS or lumbar support. 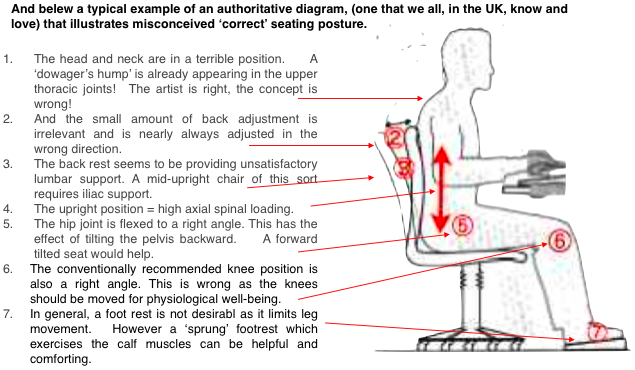 My own opinion on a number of top range chairs, as shown, is of admiration of the design and engineering mixed with awareness that the most essential bio-mechanical points have yet to be fully appreciated. The following are better than most as efforts have been made to incorporate pelvic support (with reservations). The latest version of BS EN 527-1: 2011,(the European standard specified dimensions for office desks and tables.) 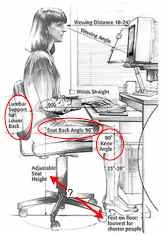 state that fixed height desks should be 740mm ± 20 mm and desks should adjust between 650mm and 850mm for sitting modes and between 650mm and 1250mm for sit/stand desks. The suggestion of a FTS would have been helpful. This entry was posted in Uncategorized on April 8, 2013 by Dr. Henry Sanford. Mandal AC. The Seated Man. Dafnia Publications. Denmark; 1985. Keegan, J.J. Alterations of the lumbar curve related to posture and seating, J Bone and Joint Surgery. 35A (3), 589-603.